We’d love your help. 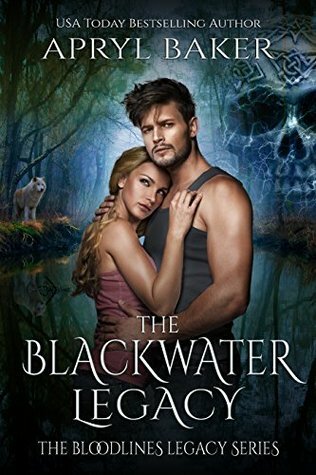 Let us know what’s wrong with this preview of The Blackwater Legacy by Apryl Baker. Saidie’s grandmother told them stories from their family history about being able to raise the dead. But Saidie believed they were only scary stories meant to frighten naughty children, and necromancers were nothing more than the stuff of nightmares Saidie Walker grew up a nice, normal girl—but not everything is as it seems. Even the Walker family has secrets locked away. To ask other readers questions about The Blackwater Legacy, please sign up. When is book 3 going to be released?? WHEN DOES THE NEXT BOOK COME OUT?? Book two in the Bloodlines Legacy series and we pick up about where book one left off. This time we follow Saidie who developed some cook necromancer powers after being around Alex for so long. She is sent to someone to train her only to have the woman try to kill her instead. The story keeps you hooked as it develops while still tying to the arching story line. We get a whole new romance as well leading *I received a free copy of this book which I voluntarily chose to write an honest review for. Saidie Walker is a pretty normal college girl til the morning she wakes up to discover she's a necromancer and somehow managed to raise her long departed dog Boco from the dead. She's sent by her best friend Alex's uncle Sabien to work with another necromancer known as "Madame" who lives deep within the Louisiana bayou, practicing and teaching her craft. While staying with Madame, Saidie meets her "family" of vampires, one of whom, Aleric, keeps trying to tell her that Madame isn't all she seems Saidie Walker is a pretty normal college girl til the morning she wakes up to discover she's a necromancer and somehow managed to raise her long departed dog Boco from the dead. She's sent by her best friend Alex's uncle Sabien to work with another necromancer known as "Madame" who lives deep within the Louisiana bayou, practicing and teaching her craft. This is one of those books on KU I found and was happy I did. I am one of those horrible people that tends to skip books that only have been reviewed by under 100 people. When this book opened I realized it would be starting with Sadie's story. I liked her as a character and the relationship she had with Aleric. Then the story catches up with Alex and all the friends again. I really enjoyed this story and hope she continues it. I liked the group of Alex's friends and all their stories. (view spoiler This is one of those books on KU I found and was happy I did. I am one of those horrible people that tends to skip books that only have been reviewed by under 100 people. I’m usually kinda skeptical about reading “second”books in a series that’s not about the original main characters. This is because I tend to just have a hard time connecting with the book. But having loved the first one and this author I wanted to give it a try. This book did not disappoint and drew me in by the second chapter. I hated having to put it down but work and “mommy” duties calls, so you could say there were a few late night reading sessions. Now I’m not big into giving details about I’m usually kinda skeptical about reading “second”books in a series that’s not about the original main characters. This is because I tend to just have a hard time connecting with the book. But having loved the first one and this author I wanted to give it a try. This book did not disappoint and drew me in by the second chapter. I hated having to put it down but work and “mommy” duties calls, so you could say there were a few late night reading sessions. Now I’m not big into giving details about books, I think everyone should enjoy the little surprises. I will say that I did love Sadie in this book. I enjoyed the way she grew into her powers and managed to stay true to herself. I was so excited when the book got back to Alex and the others. I believe it let you have more insight into Alex and Sadie’s friendship and the way the others fit in. The story was captivating and I can’t wait until the next one! I highly recommend this series. When Saidie starts college, she meets a group of people who she becomes firm friends with. They all seem to have a supernatural element to them and she doesn’t mind being the only normal human amongst them. The trouble is she isn’t a regular human, but it takes the not so fresh, recently buried, animated corpse of her dead dog to tell her that something is amiss. When Alex’s uncle sends Saidie away to learn how to use her newly awakened gift of necromancy, she hopes to be able to control her unpr When Saidie starts college, she meets a group of people who she becomes firm friends with. They all seem to have a supernatural element to them and she doesn’t mind being the only normal human amongst them. The trouble is she isn’t a regular human, but it takes the not so fresh, recently buried, animated corpse of her dead dog to tell her that something is amiss. When Alex’s uncle sends Saidie away to learn how to use her newly awakened gift of necromancy, she hopes to be able to control her unpredictable gift but something terrible is going on in the colonial plantation and she is trapped. Saidie’s gift makes for an interesting character and I was hooked on the story from the start. Full zombie action is interwoven with love interest and although they seem an unlikely mix they work. This book was even better than the first in the series and I can’t wait to read the next. Baker has an addictive style of writing that leaves you hungry for more. It takes hard work to create so many characters, maintain their necessity, and protect the integrity of a story. Baker, however, makes it seem effortless. Also seemingly effortless is her writing. A poorly written "good story" is just that: a good story that's been poorly written or rushed. I love Baker's attention to detail, her ability to translate the minute details in her mind onto paper. I feel like a fly on the wall when I read her work. Book 2 in the series this story focuses on Saidie who has to learn about her necromancy powers and is fast paced from start to finish. The friendships become stronger and the reader gets introduced to new characters who are fascinating and scary! This series has so many supernatural characters and I love them all. The plot is strong and the story well written. The adventure keeps on building with secrets revealed and more questions asked. Just brilliant! I am addicted to this series and can't wait Book 2 in the series this story focuses on Saidie who has to learn about her necromancy powers and is fast paced from start to finish. its no secret I love Apryl Bakers work. I have been giving the opportunity to receive get books before others and I have to say its AMAZING. That said let me tell you about this amazingly fantastic keep you on the edge of your seat story about Sadie! I could not put this one down. I loved the first story of the bloodlines legacy but holy cheese and crackers! you fall into this world of the spooks with necromancers, thieves, stunningly handsome Romani men and of close shifters. I mean what's not its no secret I love Apryl Bakers work. I have been giving the opportunity to receive get books before others and I have to say its AMAZING. The first book, the Blackburne Legacy, left me in awe. This second book felt more of a book that was creating a backstory for future books. I understand it's necessary but I felt there was a missed connection. The point of view changes halfway through the book and it feels like much was left out. In the end, who was even the main character of the book? I understand who the main character of the series but if the author wanted to shine a light on Sadie, shine a light on Sadie. If you are a fan of the supernatural then this is the series to read. Book one is a fantastic read, but you do not have to read it to understand this one. However i would highly recommend you do. This series has it all; vampires, werewolves, witches, necromancers, zombies, seers, shifters, and more. All set in my favorite state of West Virginia. Alex is a witch/shifter that has power that the entire world is itching to get their hand on. Sadie her best friend has just came into her power. This bo If you are a fan of the supernatural then this is the series to read. Book one is a fantastic read, but you do not have to read it to understand this one. However i would highly recommend you do. Warning: You will want to devour this book 2 of the series in one sitting! Denying yourself sleep until you too will become the walking dead. Apryl's writing has a way to sink you so deeply into her worlds she's created that you are in the story..standing in the room..cheering on the heroes and fighting the fires of evil. This book CAN be a standalone but you will be at a great loss to not read the first book. I wish I could give this book more than 5 stars! I get chills from the family intensity that is in this story. They might be from different bloodlines, but they are family. It was a little different reading Saidie's story then switching to Alex, but Ms. Baker does a wonderful job at telling us why she wrote it that way. Love how her other series was casually mentioned in this book, it is a great series as well! Now to find something to read, While I wait for the next book to be written! The second book in this series is just WOW !!! The places in Apryl's mind take you right there and make you go 😲 I love it !! We met Saidie in the first book and although this is her story it doesn't leave the first book behind. Sometimes you find love in the strangest of places. I can't wait for the next one to come out. I am definitely a fan of this series !! You will be too !! I really like how this author writes! There is still so much to the story to Alex but there is also a lot more to who her friends are. It was awesome getting to know Sadie's story and piecing together somethings for Luka. Yet still continue in on Alex's story. I am hooked! I cant wait until the next book comes out! I absolutely loved this book and struggled to put it down. I loved learning about Saidie and Aleric and I really liked how they all came together in the end. I'm hoping the rest of the series will follow this style of writing and teach us more about the history of all the members of the group. Another great book from Apryl Baker, i cannot wait for the next one! A great continuation to a great series. This series makes me crave for more. It had me at the edge of my seat on more than one occassion. Can't wait to see what else the author has in store for the Bloodlines Legacy characters. Absolutely fantastic sequel to The Blackburne Legacy! I loved the character development and learning about Saidies story. I couldn't put it down when I started it and I'm glad I didn't. I cannot wait to see what book three has in store for my favourite characters! This series has everything; witches, shifters, vampires, zombies, seers, and terror on every page. Once you start this series, you'll just keep the pages turning. There's paranormal fantasies, romance, humor, and sheer terror. I look forward to the next book. Amazing!!!! She out does herself with every book she writes, if you are looking for supernatural, paranormal and lots of mystery this is the series for you! I could not put this book down, I can not wait for the next book in this series!! Ok this book was amazing I loved how I got to see sadies story and hated what she had to endure at that psychos training, find out about Lukas brother and all that he endured and still leave with a huge cliff hanger. I can't wait for the next book. I loved this book as much as the first. Where the first focuses on Alex, this one focuses on Saidie and her heritage as a necromancer. The storyline was good and action packed. The reason for four stars were there were some editing errors and at one point the character Micah is called Morgan. Wow the second book was amazing. Great to pick up with the gang again from the first book and watch new characters come to life. Seriously, witches, necromancers, vampires, shifters what else could you want. Throw danger, romance and massive creepy bad girl and you have this amazing book !! I loved it.. it was sweet, scary, suspenseful, full of life and death.. it goes to show that not all family is blood and doesn't have to be.. I can't wait for the next one to come out.. Apryl Baker is an amazing author that knows how to reach the heart of others very well. This review has been hidden because it contains spoilers. To view it, click here. A very interesting start to this book, at first I was a little confused as I really wanted to know how Alex's story unfolded. I later seen and read that the Author wanted us to have background and see how Sadie's story evolved. A great book, can't wait to read more of the story. So who am I? Well, I'm the crazy girl with an imagination that never shuts up. I LOVE scary movies. My friends laugh at me when I scare myself watching them and tell me to stop watching them, but who doesn't love to get scared? I grew up in a small town nestled in the southern mountains of West Virginia where I spent days roaming around in the woods, climbing trees, and causing general mayhem. Nig So who am I? Well, I'm the crazy girl with an imagination that never shuts up. I LOVE scary movies. My friends laugh at me when I scare myself watching them and tell me to stop watching them, but who doesn't love to get scared? I grew up in a small town nestled in the southern mountains of West Virginia where I spent days roaming around in the woods, climbing trees, and causing general mayhem. Nights I would stay up reading Nancy Drew by flashlight under the covers until my parents yelled at me to go to sleep.